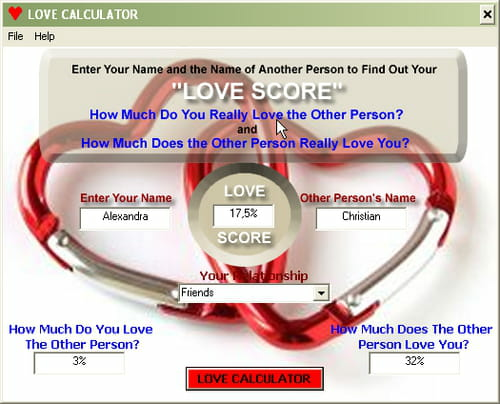 The concept of love is one that cannot be calculated or measured, but Love Calculator is an amusing application you can use to "test" the compatibility of two individuals. To use this application, simply enter the names of two individuals and choose their current relationship with each other (i.e. friends, couple, etc.). The software will then calculate the likelihood that these individuals are compatible with one another using factors such as name etymology and astrology. Latest update on February 16, 2018 at 09:36 AM.